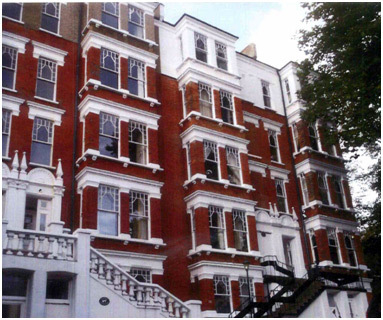 Kenwood have recently undertaken a dry rot eradication project in the Hampstead area of London. This property was an upper flat or the third floor suffering from a Dry rot (Serpula lacrymans). First referred to by Franz Xavier von Wulfen in the 1780’s under a slightly different name, it is derived from the Latin words ‘Serpula’ meaning ‘creeping’ and ‘lacrymans’ meaning ‘making tears’. In order to eradicate this outbreak Kenwood’s are irrigating the brickwork and injecting a fungicidal dry rot killer. The adjacent areas were then sterilised using a deep penetrating fungicide. Following this treatment, the walls were re-plastering using Kenwood anti-fungal rendering system.